Photo courtesy of Terrie Williams. This phenomenon finds itself at the center of research conducted by a team of scientists that was recently published in Science, in which heart-monitoring electrodes were attached via specialized suction cups to observe the behavioral and physiological responses of narwhals. Findings from the team’s study could pose a serious threat to the species given the increased human activity (namely the rise in oil and gas exploration and shipping) and melting sea ice in the narwhal’s native Arctic waters off the northern coasts of Greenland, Russia and Canada. “When the data came through from our recorders, it’s one thing to write down the number three to four beats per minute, but when you have to sit between those pauses in the heart — and we’re calling it ‘cardiac freeze’ — you get a real sense of what’s happening to this animal,” says Terrie Williams, a comparative wildlife physiologist at the University of California, Santa Cruz, who was one of the members of the international research team. Furthermore, it’s not as if the toothed whale — known for its long, protruding tusk and its moniker of “unicorn of the sea” — is remaining still. These conflicting actions lead the team to a series of questions: How do narwhals get oxygen to the brain? How do they thermoregulate (control one’s body temperature) without a properly working cardiovascular system? “The honest truth is we don’t know just yet,” Williams says. What is known is that the size of the narwhal’s heart is no bigger than that of a large cat, such as a tiger. In addition, the narwhal’s aorta hardly bears a resemblance to that of most mammals. Instead, it functions more like how hearts of fish in the Antarctic do. “We [humans] have sort of this tube coming out of our ventricle known as our aorta, and that’s going to direct blood,” Williams says. “The narwhal doesn’t have that. … It almost looks like a weather balloon sitting on top of their heart instead of an aorta, and it’s enormous. Photo courtesy of M.P. Heide-Jorgensen. While it may be natural to think the narwhal’s conflicting responses can be credited as an evolutionary/adaptive trait, Williams says that the response simply does not “make sense” when considering that two opposing signals are being sent to the narwhal’s heart. 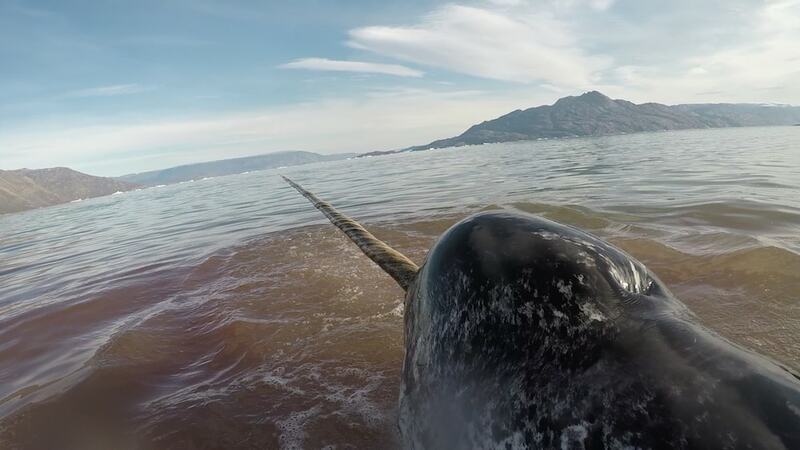 In past studies, Williams and associates have studied the narwhal’s skeletal muscles, revealing that the 90 percent of its muscles are composed of slow-twitch fibers — putting on the opposite of the spectrum from the cheetah. To compare, a human has an approximately 50/50 ratio of soft- and fast-twitch fibers. Which can be a major problem for a shy creature that has lived in relative isolation for millions of years. Now, it faces the possibility of ships coming in and human contact from gas, oil and mineral exploration — to go along with the melting of sea ice. Williams and her colleagues point to a series of mass-stranding events that have taken place in recent years, in which deep-diving whales have been found mysteriously beached upon the coastlines. Earlier this year, such an event took place in New Zealand in which hundreds of pilot whales were found at once on a beach on the country’s South Island. “We’re beginning to wonder if this is part of that phenomenon that there is something going on with the heart, cardiovascular system and brain,” Williams says. IRA FLATOW: This is Science Friday. I’m Ira Flatow. That, my friends, is the single heartbeat of a narwhal, a very stressed out narwhal at that. How can I tell? Because you won’t hear the next one until about, wait for it, wait– now. Wow, that’s how long it is between single heartbeats. This narwhal has a beat of it about four beats per minute, just four. And this whale isn’t just sitting there stressing out, it’s diving deep beneath the surface of the Arctic Ocean with a heart that is barely moving its blood around. This incredible heartbeat is the subject of new research and science this week. My next guest is a co-author, Dr. Terry Williams, Professor of Eco Physiology at the University of California, Santa Cruz. She’s here to explain what a narwhal is doing with such a slow heartbeat and why it might be bad news for them. Welcome to Science Friday. TERRY WILLIAMS: I’m very happy to be here. IRA FLATOW: You know, I still can’t quite get my head around how slow that heartbeat is and we aren’t even allowed to play it without talking between beats. TERRY WILLIAMS: You guys actually did a fantastic job. You’re the first one to try it. And when I saw it, when the data came through from my recorders, it’s one thing to write down the number 3 to four beats per minute, but when you have to sit between those pauses in the heart, and we’re calling it cardiac freeze, you get a real sense of what’s happening to this animal. IRA FLATOW: And you know what the most amazing part besides that difference in beat is that the whale is really swimming fast while this is happening. TERRY WILLIAMS: You know that was the shocking part, you think about an escape response for an animal and they have two choices, just fight and flight and get the heck out of danger, or to hunker down like a scared rabbit. And now we’ve got two things happening at the same time, a heart beat that sounds like a scared rabbit and then they’re swimming as fast as a narwhal can swim. IRA FLATOW: Well how do they sustain that? Is that sustainable for a narwhal to have these competing stresses there? TERRY WILLIAMS: You know it was surprising that they could withstand that for over 10 minutes and that’s something I had never seen before in any marine mammal and that has led us to a huge question, how do they get oxygen to the brain, how do they thermoregulate when the cardiovascular system isn’t working normally. And the honest truth is, we don’t know just yet. IRA FLATOW: Now do they have special adaptations of any organ that might allow the blood to work while it’s not beating? TERRY WILLIAMS: You know, it was interesting. There was a hunt going on at the same time we were running these experiments and I was able to take a look at the narwhal’s heart and I thought maybe the heart’s bigger, maybe it’s just going to compensate that way, but it wasn’t. They have a heart that proportionately is like a cat’s heart or tiger heart, but the thing that was so remarkable is when you looked at the aorta, we have sort of this tube coming out of our ventricle known as our aorta and that’s going to direct blood, the narwhal doesn’t have that. It almost looks like a weather balloon sitting on top of their heart instead of an aorta and it’s enormous it’s this elastic balloon that, if you imagined of the heart beating and it pulses blood into this balloon, it expands out and then over time, we think that it slowly just lets blood leak out for that period of time in between beats. So That’s it’s like an auxiliary heart, sort of. an extra chamber, you know. TERRY WILLIAMS: Well, in a way it’s very much like how a fish heart will beat in the Antarctic, you have a very slow heartbeat and that’s what got me thinking in terms of the functionality of this structure. IRA FLATOW: And so would this be an evolutionarily adaptive response ever? TERRY WILLIAMS: In terms of this response, it doesn’t make sense. And other scientists have told me that because you’re sending two opposing signals to the heart, a set nerves are saying you go beat faster, and a set of responses are telling you beat slower. And in fact, not only beats slower but beat at a very, very slow level. And in other animals, and in humans, this can lead to fatalities. IRA FLATOW: What’s interesting about this is that this occurs when the narwhal thinks it’s in trouble, right? It’s under stress and where our hearts start beating faster, we want to get out of the way, this thing slows down. And what is it escaping from, something that wants to eat it? TERRY WILLIAMS: Well, the normal escape for a narwhal, say, a killer whale has come in and that’s one of their natural predators, what the narwhal will do is sink very slowly underneath the ice and they basically just out dive the killer whale and it’s very slow. You know, we’ve looked at their skeletal muscles in past studies and if you think of a cheetah on one end of the spectrum and humans have maybe 50-50 slow twitch, fast twitch fibers, the narwhal has 90% slow twitch fibers. TERRY WILLIAMS: I’ve never seen an animal quite like that. It couldn’t swim really fast if it wanted to. IRA FLATOW: Now I remember being in Antarctica myself and watching the seals and deep diving seals and you mentioned how cold it is and what happens the heart rates of fish, but don’t seals dive down deep below the surface and is their response different in their heartbeat than the narwhals? TERRY WILLIAMS: You know that’s a great question. The issue is that we’ve never put instruments on these animals to monitor a fear response. I think this is one of the first times that we’ve had this kind of technology on a deep diving marine mammal to record this kind of thing and it has a lot of us pretty concerned. IRA FLATOW: Does this tell us anything about how we humans will affect the Arctic and the things that live and swim there? TERRY WILLIAMS: Well, you mentioned that the narwhal was a shy animal and I think it’s, yeah it’s because it’s lived in isolation in the Arctic for millions of years. You’ve got less ice in the area now, you have the potential for ships coming in and humans coming in, oil exploration, mineral exploration, and yeah these are things that this animal has just not encountered. And we’re wondering if in fact the problem is going to be on, they’ve got this unusual as we call it, a paradoxical fear response, that’s occurring and their bodies just aren’t built for it. 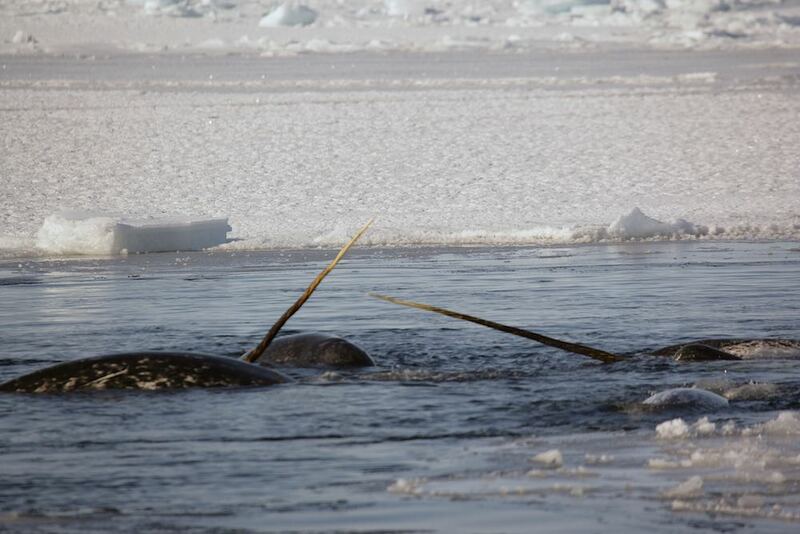 TERRY WILLIAMS: Well, it’s tough to define a narwhal carcass in such a remote area. But what we’re seeing along other coastlines are deep diving whales coming up in these mass draining events. There is just one early in this year in New Zealand, you’ve got 600 plus whales that have beached themselves and we’re beginning to wonder if this is part of that phenomenon. That there’s something going on with the heart, cardiovascular system and brain. IRA FLATOW: Dr. Williams, thank you for taking time to be with us today. Very, very interesting stuff. Dr. Terry Williams, Professor of Eco Physiology at UC Santa Cruz. TERRY WILLIAMS: Thank you very much. IRA FLATOW: Thanks for joining us. After decades of absence, whales are back in New York City waters. Scientists say it could signal a wildlife resurgence. Researchers say earwax can provide data about pesticide exposures, hormone levels, and even stress levels of the endangered blue whale.